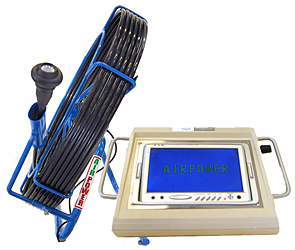 The Air Power Flue Camera is the ideal tool to monitor the condition of flues and ducts. It can be connected to a video system to record the monitoring on a video tape. The Air Power Flue Camera’s colour CCD element lens rotates remote controlled unrestricted around its vertical axes. The camera lens can also be moved vertically within a 110 degree angle, also remote controlled. The diameter of the camera module is 45mm and length 130mm. The camera module is also equipped with 12 adjustable, high power LEDs to illuminate the flue to be examined. The colour display is equipped with contrast and lightness adjustments and a video output connection. A magnet behind the display provides a handy fastening possibility on site. The 20 meter cable on a reel has markings within 1 meter intervals to show the position of the camera unit in the flue. The camera unit and the cable are splash water resistant. When not used, the system can be stored in the heavy duty storage box with 510mm x 240mm x 240mm dimensions. 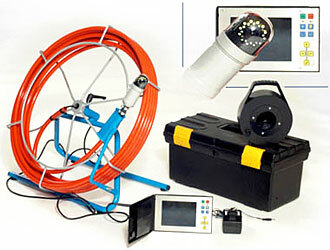 The flue camera equipment is ideal for usage in ducts of sizes of 100-650mm. Cable reel with a plastic hose for the cable and a connection for the camera from the centre of the reel (blue reel with red hose in the picture).